Hello and welcome to this quick little video, which gives you a great insight into making the most of the WordPress Editor and creating awesome looking posts and pages! In this video I’m going to be guiding you through how the WordPress Editor works and the most useful tools that are available! 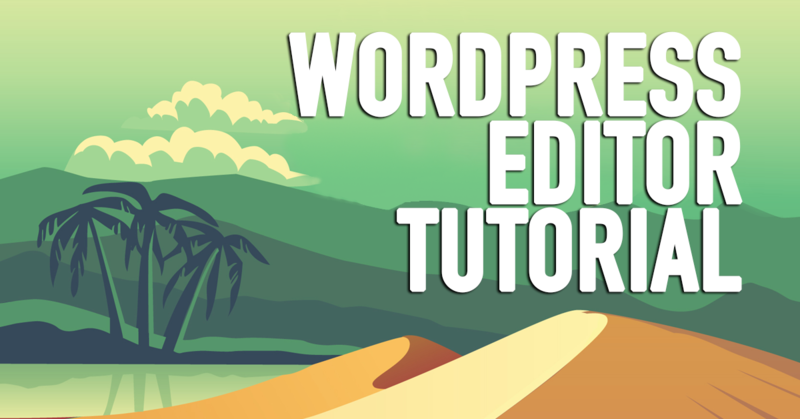 Lets jump straight in and start learning all about the WordPress Editor! Just like the Dashboard, the Editor’s layout can be customized to how you like. You can minimize the meta boxes as well as drag them to where you like, or use the Screen Options tab to hide boxes you don’t need. You can completely customize the Editor with the functions that work best for you. If you’ve ever used Microsoft Word, then you’ll find using the Editor even easier! The buttons along this toolbar allow you to easily format text by highlighting a word or phrase and then clicking the buttons to apply the formatting to the selected text! If you’re in your editor now, try it! Just highlight some words and make them bold, then italic. See how easy it is? You can also create bullet points and numbered lists by clicking these buttons and typing; adding each bullet point or list item at a time. You just tap the enter key to create a new bullet point or list item. You can also highlight and bring attention to text like quotes by using the quote button. Or you can use a horizontal line to break up large sections of text as well as aligning text to the left, middle, and right. Creating a link is easy! Just highlight the text then click on the Create a Link button. There is a popup that comes up. All you do is fill in the link address, which is where people will be taken when they click the link, and the link address, which is a little popup describing what the link is. You can choose if you want this link to be opened in a new window or a new tab. This is a great way to link other websites with yours, but it’s also great to link to your own existing content. You can do this by selecting a post or page from the list at the bottom of the window. When you’re done just click on Add Link and that bad boy will now be a link on your post or page! To remove a link, just highlight it and click on the remove link button. When creating a larger article, you can just show the first paragraph with a Continue Reading button. This way your pages will look clean and tidy and your viewers can easily read your content. You can do this by using the More button. Just click where you want the Continue Reading button to be and click on the More button. The viewer will not see any content below this divider. They’ll have to click on the Continue Reading button. By clicking on the Toolbar Toggle button, you’ll find more tools on the toolbar including Paragraphs and Headings, Underline, Justify text, and text colors. If you’re copying text from another website or Word, you can enable the Plain Text mode by clicking on the paste as text button. Any text you paste into the editor will be formatted and cleaned so you can then make it how you like. You can also remove formatting from selected text in your editor by using the button next to it, the clear formatting button. To insert special symbols or characters, click on the symbol button and you have lots to choose from! You’ve also got indent text in this area. Other options that are very useful are the undo and redo buttons. So, if you ever make a mistake and you want to undo it, it’s easy! Or if you decide you want that after all, you can redo it! The last button in the row is the keyboard shortcuts button, which you’ll want to have a look at. It has all the keyboard shortcuts available to use to speed up your editing! A new amazing feature is the distraction free writing mode, which is enabled by clicking on the button in the top right below the Visual and Text tabs. As you can see, all the other elements disappear so you can focus on your content. You still have access to all the toolbar buttons and you just have to move your mouse to the side to access the other elements again. To disable this feature just click it again. At the top right of this editor are two tabs, Visual and Text. We’ve been working in the visual tab. However, if you select the text tab, you enter the code editor and can work with HTML. As you can see WordPress has been writing the html for our post. Covering aspects of HTML is a much bigger topic and is beyond the scope of this video, but you can view more over on our website at www.WebsitesMadeEasy.tv. Creating pages and posts in WordPress is straight forward. So, once you’ve familiarized yourself with the buttons in the toolbar, play around and start creating your first post! In the next video, I show you how to add images and videos to your pages and posts! If you enjoyed this video, please give it a quick like and share it with your friends! Thank you and see you in the next video!